After Director Sam Peckinpah shot the traditional western full of holes in The Wild Bunch (1969), the genre was going to need new narratives to replace the decades old plot tropes that were becoming stale and predictable in order to connect with a younger audience that was growing weary of the western. Hollywood was surprisingly quick to adapt, with Richard Harris in A Man Called Horse (1970) and Dustin Hoffman in Little Big Man (1970), two films that presented the western through the eyes of the Indians. 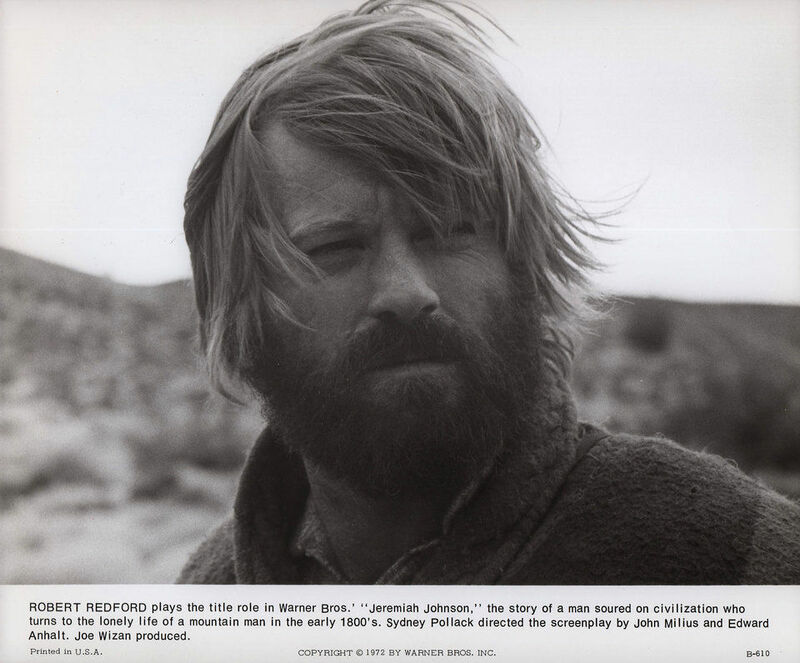 Harris returned to the genre with Man in the Wilderness (1971), a tenacious survival story that posted cinematic mile markers for Jeremiah Johnson and eventually, The Revenant. 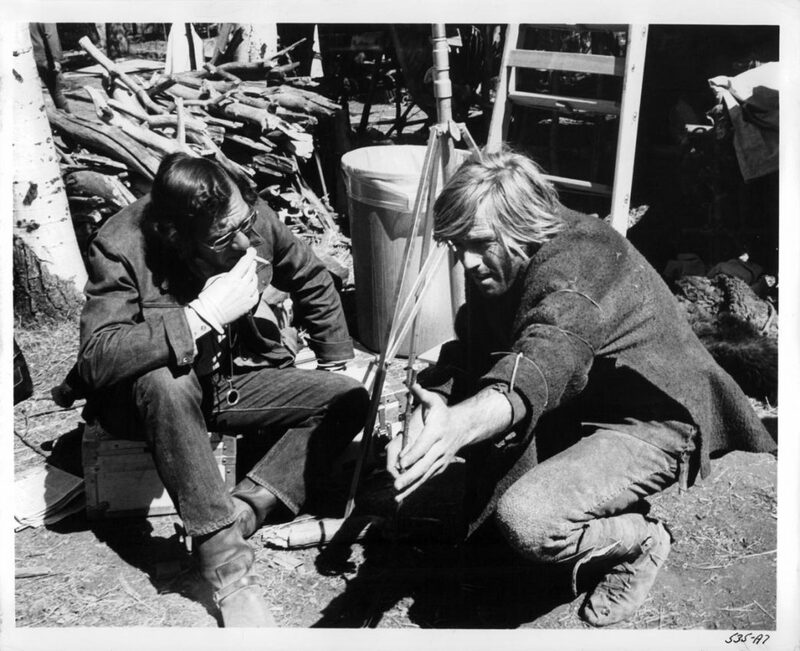 Sensing the paradigm shift, two actors that would become film icons, eschewed their polished good looks for bearded, rugged frontiersmen – Warren Beatty in Robert Altman’s McCabe and Mrs. Miller (1971) and Robert Redford in Sydney Pollack’s Jeremiah Johnson (1972). These westerns were not your father’s Oldsmobile as it were, and spoke to a younger generation of filmgoers who were coming to terms with our country’s involvement in the Vietnam war, with characters who were outside their respective political and religious establishments and determined to live or die on their own terms. Unlike the gunslinging, western hero antecedents, Jeremiah Johnson’s “showdown at high noon” would be his daily survival, as the marrow of the mountain unleashes fierce weather conditions, wild animals, loneliness and the mighty Crow warriors who hunt him. 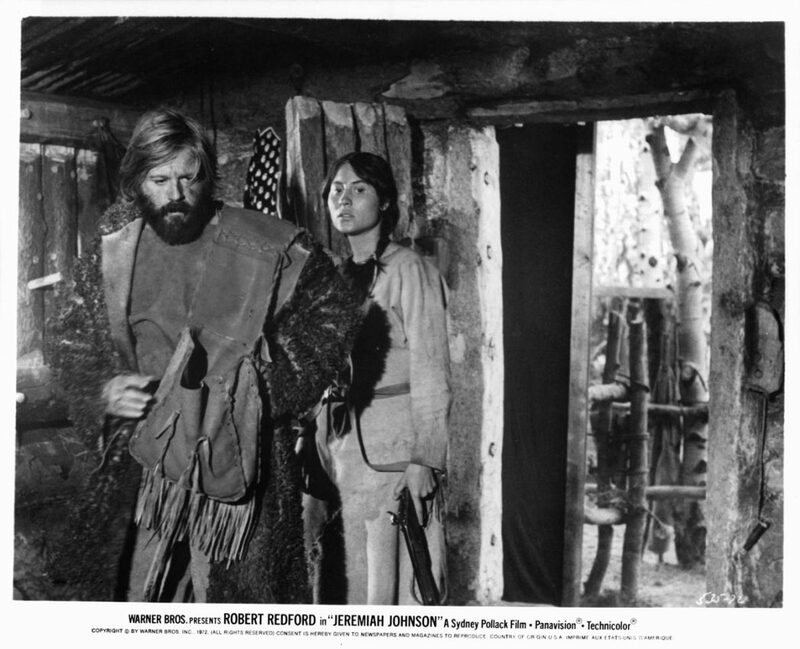 Based on the novel “Mountain Man” by Vardis Fisher and the story “Crow Killer” by Raymond W. Thorp and Robert Bunker, with a screenplay by John Milius & Edward Anhalt – director Sydney Pollack and Robert Redford collaborated for their second of five films they would make together, with Jeremiah Johnson proving to be their most arduous. In what was initially going to be a property for Lee Marvin, then Clint Eastwood, with Sam Peckinpah set to direct – the two iconoclasts didn’t see eye to eye and Eastwood went off to make Dirty Harry (1971) – while Peckinpah went overseas to tackle Straw Dogs (1971). Warner Brothers set up the film with emerging star Robert Redford – just a couple years removed from the release of Butch Cassidy and the Sundance Kid and Downhill Racer (1969), and Redford brought Sydney Pollack on board. Extensive re-writes by John Milius took an initial 5K writing job up to $80,000. Adhering to strict budget constraints and with Pollack going so far as to mortgage his house (a recurring theme from 1970’s auteurs) to help ensure the film would get finished, the unpredictable and harsh weather conditions allowed for minimal takes from the crew. 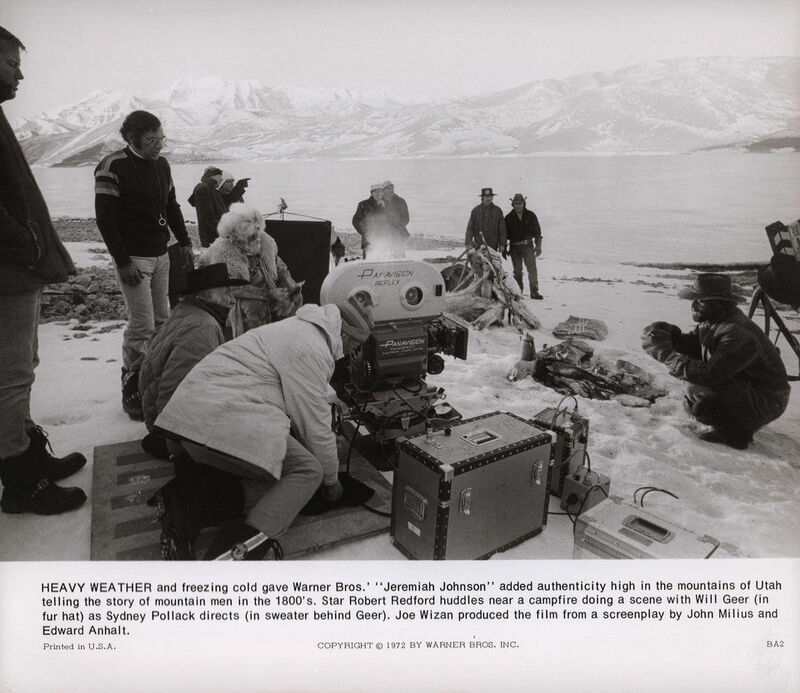 Some of the shots in Jeremiah Johnson, with its pristine snow covered vistas and a barely visible Redford struggling with his horse in a blinding snowstorm, shares a misery index that is on par with Friedkin’s Sorcerer – another notoriously difficult shoot. Shot across Utah in St. George, Sundance Resort, Snow Canyon State Park, Uinta National Forrest, Mount Timpanogos, and Zion National Park to name a few of the nearly 100 locations that were used, cinematographer Duke Callaghan captures some of the most breathtaking scenery ever photographed. Known mostly for his television work, Callaghan fills up the screen in a 2.35:1 aspect ratio with the majesty of the changing seasons and topography so stark in contrast, they reveal landscapes resembling different planetary changes. It’s a stunning visual achievement and can hold its ground with anything Gordon Willis, Haskell Wexler, Roger Deacons, Janusz Kaminiski, Conrad Hall, Caleb Deschanel or other contemporaries have captured on film. 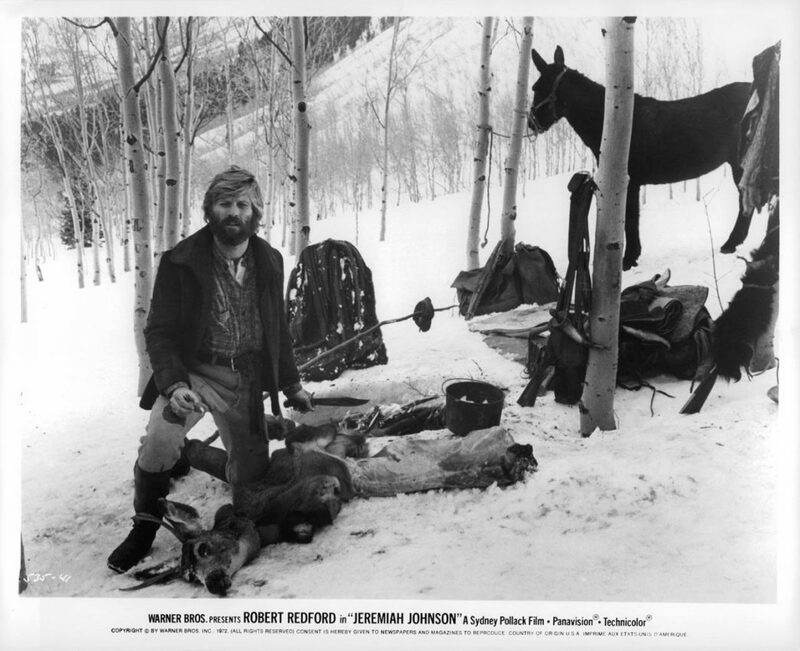 Before the title of the film is even on the screen, the narrator tells us that Jeremiah Johnson “bought him a good horse and traps, and other truck that went with being a mountain man and he said “goodbye” to whatever life was down below.” Wearing a Mexican War uniform as he first rides his horse onscreen, the ‘life down below,’ while never discussed, clearly scarred Johnson and his call of the wild isn’t to stake a claim and prospect for gold in search of earthly riches, but rather to disappear into the rugged terrain of the mountains for a (mostly) solitary existence. Being a Mountain Man is not a lifestyle that affords you the courtesy of a learning curve, and Jeremiah’s early struggles include; trying to catch trout with his bare hands in a nearly frozen stream – where he encounters an Indian on horseback that views him as more of an oddity than a threat, and Jeremiah’s inability to start a fire when he’s soaked to the bone. The dangers of the snow covered mountains and harsh winter are not lost on Johnson when he comes across the frozen corpse of “Hatchet Jack,” with a will pinned to his coat written on animal hide, that bequeaths his bear rifle to whomever finds his broken legged corpse. Hatchet was done in by a bear, but not before shooting it dead with his rifle – “A .50 caliber Hawken!” serving as a warning to Johnson, that even an experienced mountain man can meet a quick demise if you’re not vigilant, and in some cases, just plain lucky. Weak with hunger after the winter conditions take his horse, Jeremiah has the good fortune to run into an old trapper – “Bear Claw” Chris Lapp (Will Greer) that hunts Grizzly bears, and tells Jeremiah, “that whatever you learned down in the flat, will serve you no good up here. You’ve got some work to do.” It’s Bear Claw’s mentorship that teaches Jeremiah the lay of the land, how to work and hunt it, but most importantly, which tribe of Indians are to be feared – the Crows – being “mighty warriors, too.” Geer is so convincing as the elder mountain man, you can lose yourself in his scenes that have an almost documentary feel of intimacy, with dialogue by John Milius that captures the colloquialism of the era. When the two men “trespass” on Crow land while hunting, they are confronted by Paints-His-Shirt-Red, the same Indian that saw Jeremiah struggle to catch fish with his bare hands. At a translation disadvantage where the Indians are concerned, Jeremiah must rely on Bear Claw to translate for him. It won’t be the last time he needs to trust somebody to explain the stakes of the situation he has found himself in. After old man Lapp holds up his necklace of bear claws as a gift to allow the two white men safe passage on their horses, it’s clear that offer will come up short. While Paints considers taking the men’s horses, Jeremiah offers up a generous trade of freshly skinned pelts. This unselfish offer resonates with Paints as a genuine sign of respect, and the two men begin to form an unlikely bond. 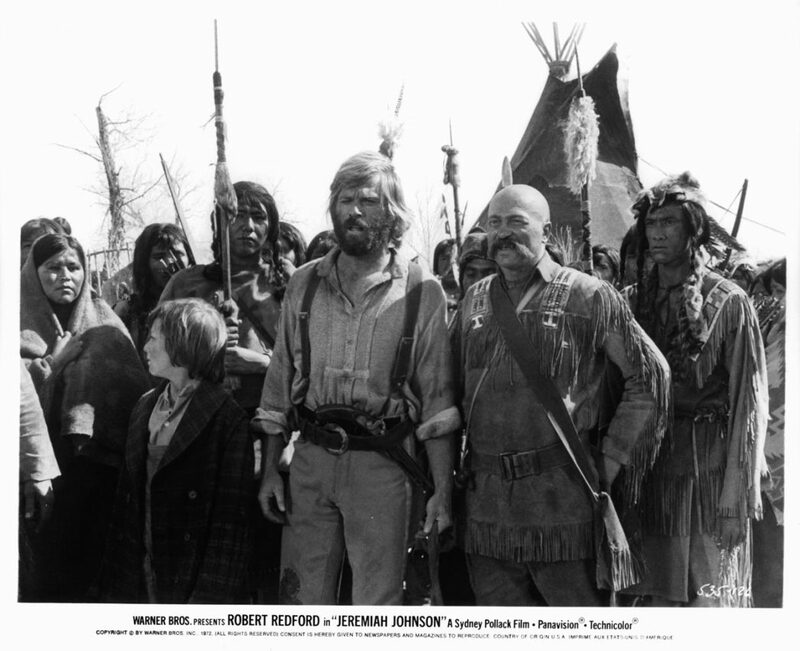 It’s hard not to juxtapose scenes in Jeremiah Johnson when some of the white men in the film marginalize the Indians and their customs, with the Dakota Pipeline (DAPL) and the current standoff that has captured social media during 2016. Even after all history has shown us in regard to indigenous people, there are those that still struggle in the face of their own greed, to show the respect that Jeremiah Johnson was willing to give the Indians in his deal making – with no angle shooting. Later, when Johnson parts ways with Bear Claw Lapp and sets back out on his own, he is welcomed by the Crow Tribe and trades with Paints-His-Shirt-Red. The two men even share the peace pipe. Sadly, this is a peace that is short lived in the complicated world between these men and their two cultures. After a grieving mother begs Johnson to take in a traumatized young boy rendered mute by the violence he has witnessed perpetrated against his family, and after unknowingly putting the Chief of the Flathead tribe in a position to gift Jeremiah something of great value, he must accept the Chief’s daughter Swan (Delle Bolton) to be his bride – in a deal translated by Del Gue (Stefan Gierasch) a man that Jeremiah had rescued who was buried up to his neck in trouble. Gue warns Jeremiah that to turn down the gift is to sign their death warrants, and begrudgingly, Jeremiah’s plans for a solitary existence have been usurped by the hands of fate. Johnson’s loneliness ran deeper than he realized, however, when after his new wife and son find a good piece of land to settle down and call home, they build a stable log cabin together, and Jeremiah begins to show signs of an emotional equanimity that had been sorely missing since he returned from the war. When Swan makes a bear skin wrap for him, he is genuinely touched at the thoughtfulness and skill that went into making it. He is finding an unlikely peace in the heart of the mountains. Unfortunately for Johnson, from the parts of civilization where the river grows wide and is filled with steam boats, to the battlefields of the Mexican War, all the way on up to the highest points of elevation in the Rocky Mountains where a horse and mule struggle to carry the most essential survival tools – no matter how far Jeremiah seeks to distance himself from the people he no longer feels akin to – they find him. A U.S. Calvary rescue party has sought him out and encroach upon him to help lead them to a stranded wagon train that won’t last long in the crippling snowy weather. When the rescue party led by Johnson comes to a Crow burial ground that Jeremiah warns is “big medicine” and “guarded by spirits” his advice to go around the sacred land is met with defiance and the fate of the stranded wagon train is leveraged against him. Jeremiah reluctantly agrees to lead the Cavalry through the sacred land, and it isn’t until Johnson is heading back through the burial ground, after successfully leading the rescue party to the stranded settlers, that the gravity of the situation and the potential consequences overtake him. The bloody aftermath that follows Jeremiah’s fateful turn as guide, forever changes him, and the film changes accordingly – fueled by Jeremiah Johnson’s vengeance. He becomes a man that’s antithetical to why he communed with the mountains in the first place, and the Crow tribe’s greatest and most feared enemy. He’s now a man that is attacked by single Crow warriors in succession, evocative of the shogun’s executioner in the Lone Wolf and Cub martial arts series, who was also nomadic in the revenge of his wife – killing all who came for him with pitiless precision. 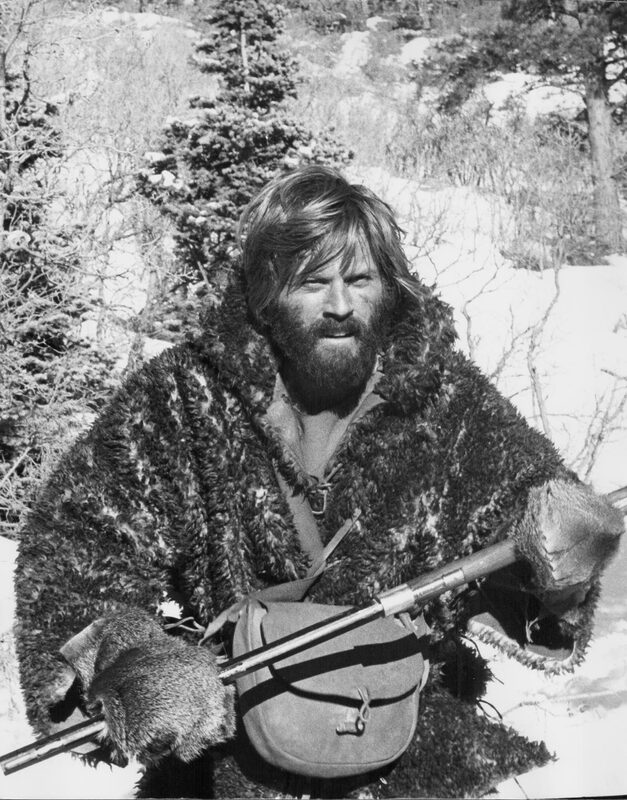 When Bear Claw Lapp comes across Jeremiah Johnson alone and weary next to a campfire, wearing the bear skin shawl his wife had made for him, he realizes that Johnson’s transformation is complete as a mountain man. Johnson’s loss of time, “What month is it?” and ability to stay alive while doggedly pursued by the best warriors the Crow continue to send, serve to prove that this “pilgrim” that Bear Claw took under his wing, has turned into the most respected mountain man these parts have ever seen. Jeremiah Johnson speaks to feelings and fears that men keep in the dusty cellar of their hearts that we don’t really talk about. 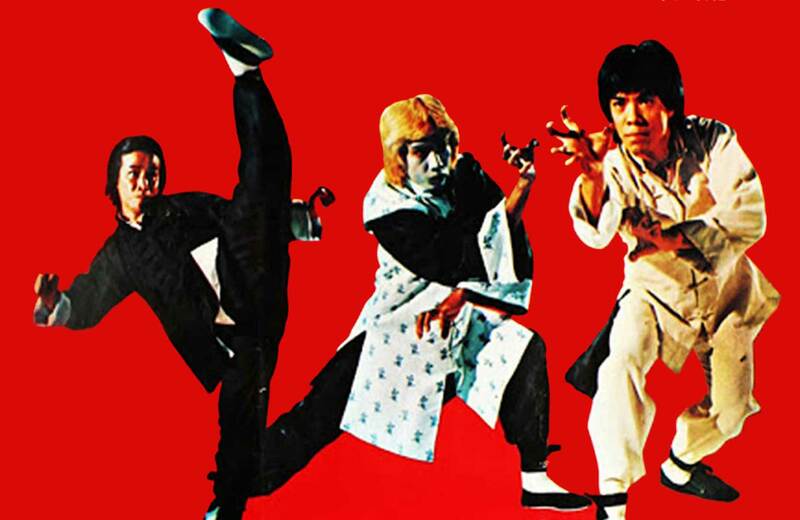 Could I defend myself in a fight where somebody was trying to kill me? How much physical pain could I endure before I received medical help? How much personal loss could I live with and still go on with the business of living? Could I hunt for food if it was the difference between eating and starving? At my core, what am I really made of? What can I live through that will define that? Robert Redford’s performance takes that journey for us, and Director Sydney Pollack skillfully includes us in the pilgrimage. Pollack and Redford spent seven and a half months editing Jeremiah Johnson, and the attention to craft almost overwhelms you on the big screen. Jeremiah Johnson reminds us that no matter how much dignity and integrity we attempt to live our lives with, there are people and things out in the ether, just waiting to careen into us. We can only hope we can meet those things with the heart of Jeremiah Johnson.